Click below to read the rest of the post to see the full list of required materials for each group. In addition to those lists, please replenish materials in your kits as they were for Fall semester. This entry was posted in SPRING 2012 and tagged material archive, materials on February 27, 2012 by ruralscape. While at home be on the look out for BOXES! 2. Closes. It has an inside and an outside. 3. Can be altered, taken apart or adapted. Avoid something that you want to leave ‘as is’. 4. At least one foot long in one direction, but can be larger! 5. It should be interesting, unusual, or distinctive and something you LIKE. 6. It should NOT be new. This should be purchased at a thrift store or garage sale or found in your parents basement! Please do not purchase a new box at a craft store! You will need this on the FIRST day of class! You may want to bring a couple so you have choices! PS. 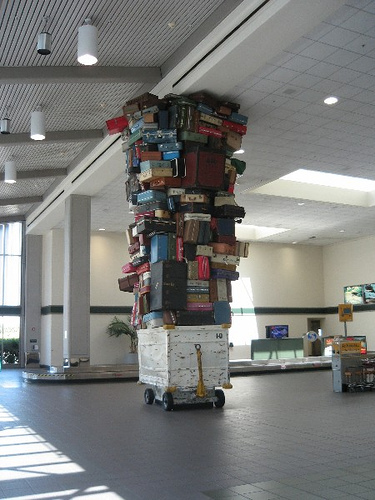 Check out http://www.greenecoservices.com/top-20-ways-to-reuse-old-suitcases/, a fabulous blog that shows the top 20 ways to reuse old suitcases! This entry was posted in SPRING 2012 and tagged coLAB, materials on February 27, 2012 by ruralscape.